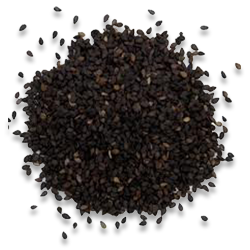 Sesame grows in well drained, sandy loam soils. Coarse sandy soils and soils of alkaline and saline nature are not suited for the crop. Kayamkulam-2(Thilothama) Suitable for rice fallows in Onattukara, resistant to leaf spot disease. Thilathara (CST 785 x B14) Suitable for the summer rice fallows of Onattukara, oil 51.5%, duration 78 days. Prepare the soil into a fine tilth by ploughing 2-4 times and breaking the clods. Seed rate is 4-5 kg/ha. Broadcast seeds evenly, preferably mixed with sand 2-3 times its volume, to ensure uniform coverage. Work with harrow, followed by pressing with wooden plank so as to cover the seed in the soil. Apply FYM/ compost as basal dressing and incorporate into the soil along with last ploughing. Apply fertilizers as basal dose when there is enough moisture in the soil. Urea is preferable to ammonium sulphate. Nitrogen may be applied in split doses, 75% as basal and the balance as foliar spray at 3% concentration, 20-35 DAS keeping the discharge rate at 500 l/ha. After cultivation of the crop may be done twice, first at 15 days and the next 25- 35 DAS. When the plants are about 15cm in height, thin the crop so as to give a spacing of 15-25 cm between plants. Surface irrigation at 3cm depth during the critical stages, viz: 4-5 eaves, branching, flowering and pod formation will increase the yield by 35-52%. Two irrigation of 3cm depth each in the vegetative phase (branching) and in reproductive phase (at flowering or pod formation) are the best, registering maximum yield and water use efficiency. In the case of single irrigation, it can be best given in the reproductive phase. In the tail end fields in command area, the best use of sparingly available water can be made for augmenting sesame production. Azadirachtin 0.03% at 5 ml per litre spray at 7th and 20th DAS and thereafter need based application can manage the incidence of leaf and pod caterpillar, pod borer infestation and phyllody incidence. Harvest the crop, when the capsule turns yellowish by pulling out the plants. Harvest during the morning hours. Cut the root portion and stack the plants in bundles for 3-4 days when the leaves will fall off. Spread in the sun and beat with sticks to break open the capsules. Repeat this for 3 days. Preserve seeds collected during the first day fo seed purposes. Clean and dry in sun for about 7 days before storing.